Mary’s Tips for getting new ventures underway are invaluable. From Passion to Profit provides new entrepreneurs with the rudiments of entrepreneurship and business with lessons on planning, funding, finances, employing, outsourcing, and facilitating contracts/ agreements. As a business coach with much valuable experience, Mary offers sound, simple, and practical strategies for Do-It-Yourself marketing and PR campaigns. Dedicated to helping budding entrepreneurs, Mary discusses the minute details that are commonly overlooked, but necessary for one’s personal and business success. As a Life Coach, Mary tackles issues that many of us prefer to ignore, particularly our health, both physical and emotional. I have been an entrepreneur for decades, but still found myself re-reading passages and covering my desk with reminder notes. The link between passion and entrepreneurship is a strong one and absolutely vital to the success of any enterprise. Mary’s passion for making a difference through social entrepreneurship is an inspiration to us all. It’s been a pleasure to serve as her editor and writing consultant. 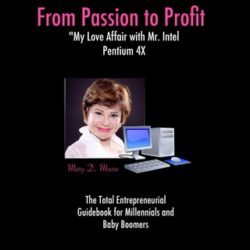 Reading her book, From Passion to Profit, has revived and revitalized all the passion that compelled me to set out on my own entrepreneurial adventure years ago. Read her book, and you’ll be ready to go boldly forward on that adventure, too.